Gold is a 20-pay-line, 3-row and 5-reel online slot by Big Time Gaming. You’ll be sure to score big once you line up identical symbols consecutively. 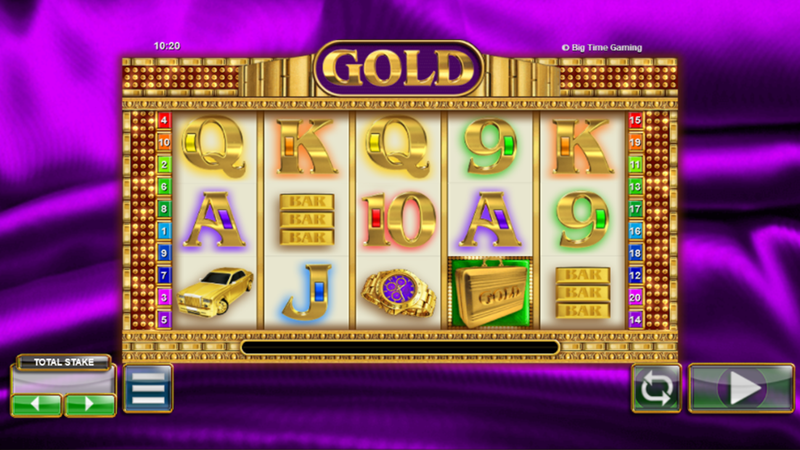 Our Gold slot review will inform you on how to play this slot and sort out any questions you may have. Pay attention to the suitcase and find out what the BIG golden disc does. Hint: it might have something to do with the Gold free spins. Want to see how Gold works? Select a recommended casino site from the list below and start playing for free or real – our screenshots will give you a sneak peek! Reveal the Gold free spins and gain 15 free games during the free play feature by scoring 3 or more Gold discs. Take a bet from 0.01 to 2000 by choosing between 1 – 20 pay-lines and a coin value of 0.01 to 100 per spin. The Gold free spins are truly special, as all Gold bonus free game wins will be multiplied by x5. You may even benefit from a x2 multiplier during normal games, as all Gold suitcase wins will be doubled. The suitcase acts as a wild feature and replaces all other Gold symbols except the disc. The jackpot of 10.000 may be scored with 5 Gold suitcases in a row. The Gold disc may grant you up to 180 Gold free spins. During the Gold bonus free games, you may find your wins multiplied by a factor of x5. This slot by Big Time Gaming can be played in the mobile web version without any restrictions. No download needed. 3. What is the RTP factor of Gold? The flashy RTP of Gold was placed at a lucrative 95.03 %. Give the Gold video slot a try and you might benefit from several multipliers. The high jackpot and the generally quite generous pay-line wins may make you leave this Golden environment as a big winner. Gold gets a well-deserved good rating is the coherence of it all: all the icons are covered in gold and in the background you can hear the homonymous song by Spandau Ballet. If you’ve made it so far in this Gold slot review, then you might as well begin your quest as soon as possible.